What a lovely day. We’ve been at my parents house for a fantastic massive family Boxing Day lunch – with 20 or so family members, so pretty busy. I volunteered to bake a cake and decided to make a massive one to feed lots of people. However, I didn’t take into account the fact that we’d all have had a massive lunch and that some people needed to leave before it came to tea time, so there was a bit left – oh well, all the more for me! Everyone seemed to love it, so I think it was a hit. 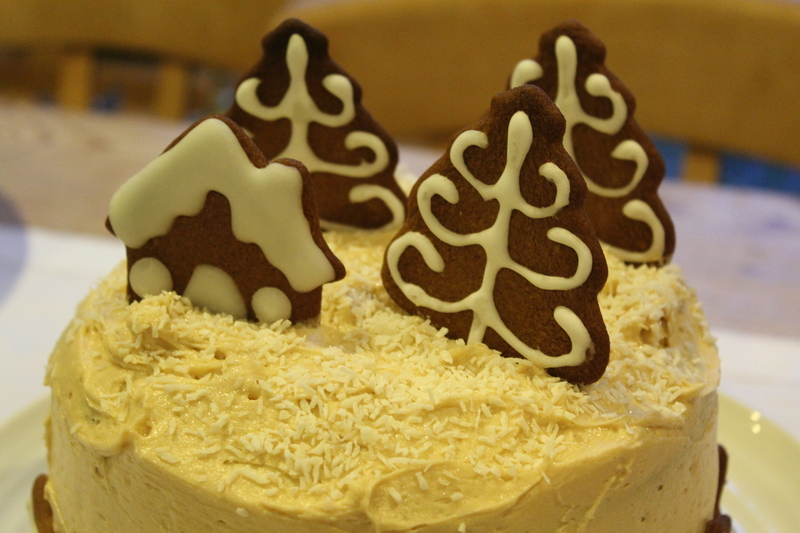 It was great fun to decorate as well, but icing all the gingerbread biscuits did take time. It’s not essential to make you’re own, but if you have time I would – not only is it satisfying, but the biscuits do taste yummy too. 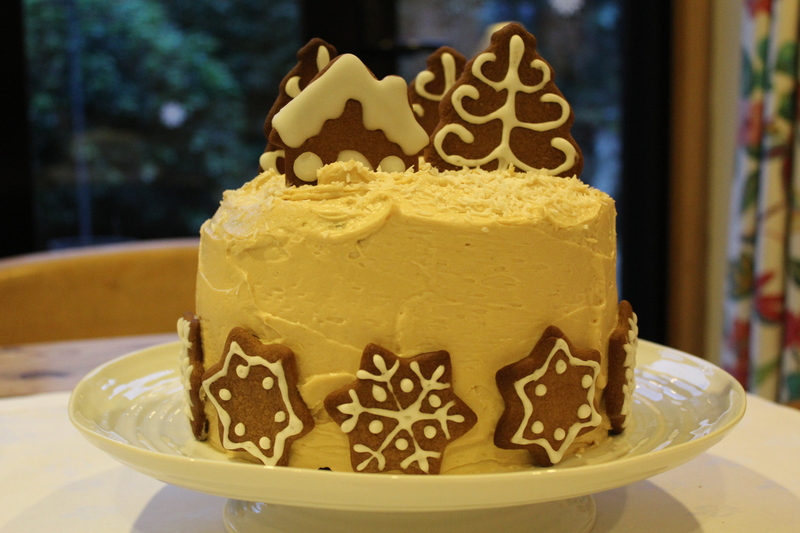 I did make the cake about a month ago and froze it as I knew it would be busy in the run up to Christmas. It really does improve in the freezer as it was so deliciously moist and the flavours really developed. Measure the milk and treacle into a saucepan (grease the measuring spoon with a little oil first and the treacle will easily slide off). Bring to a gentle simmer and stir until combined, then set aside to cool. Meanwhile, grease 3 x 20cm loose-bottomed cake tins with a little oil and line the bases with baking parchment (if you don’t have enough cake tins, just divide the batter into three and leave aside till needed). If the tins are any shallower than 4cm, line the sides with a deep collar too. Heat oven to 180C/160C fan/gas 4. Measure the flour, baking powder, bicarbonate of soda, sugar and spices into a large bowl, then add 1/2 tsp fine salt. Mix the dry ingredients together with a large whisk; if there are any large lumps of sugar, squeeze these through your fingers until you have an even, sandy-textured mixture. In a jug, whisk the oil, buttermilk, eggs, rum and vanilla. Add the milk and treacle mixture, and mix well. Pour the wet ingredients into the dry, and whisk into a smooth batter. Divide between the tins and bake for 25-30 mins until a skewer inserted into the centre of the cakes comes out clean. You may have to swap the cakes over to cook evenly, but don’t do this until they’ve had at least 20 mins cooking. Cool the cakes in their tins for 10 mins, then transfer to a wire rack, peel off the parchment and leave to cool completely. Once cooled, you can wrap the sponges in cling film and store in a cool place for 4 days, or freeze for up to 2 months – the texture and flavour will be all the better for it. I froze my cakes for about a month and they were so deliciously moist and froze really well. To make the icing, put the butter and half the icing sugar in a large bowl. Mash together roughly with a spatula, then whizz with an electric hand whisk until smooth. Add the remaining icing sugar, the cream cheese, vanilla bean extract and biscuit spread. Mix again until smooth and evenly mixed. Transfer half the icing to another bowl and set aside. 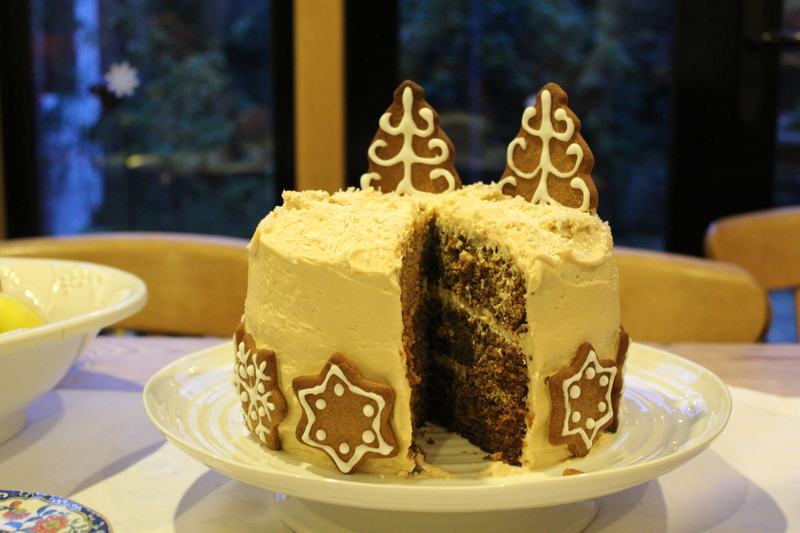 Use the remaining icing to stack the cakes and cover the entire outside in a thin layer – don’t worry about making the cake look too neat at this stage, as any crumbs trapped in the icing will be covered in the final coat. Chill the cake for 30 mins and the remaining icing for 20 mins (remove the icing from the fridge 10 mins before the cake to soften a little). When the icing on the cake is firm, remove it from the fridge and use the remaining icing to cover the cake. Smooth the sides using a palette knife, but leave peaks and dips on top for your snow scene. 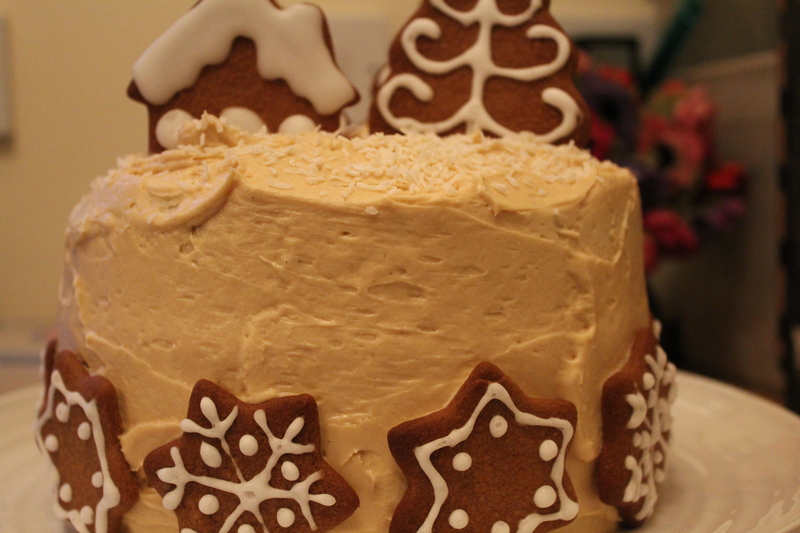 Top the cake generously with desiccated coconut, a dusting of sieved icing sugar and some edible glitter, if you like, then decorate the top and sides with gingerbread shapes (see earlier post). If you’re not eating the cake within a few hours, store it in the fridge, but bring back to room temperature before serving. Will keep for 2 days.